Ideally, parents schedule a newborn photo session during the second- or early third-trimester to get on the photographer’s calendar, and Weeks 1 through 8 of newborn life are optimal for capturing the essence of teensy-tiny babies. If I'm totally honest, pre-Week 6 is even better; the majority of my best sleeping poses were taken around week 5 or prior. Then again, some 2-week old babies cry through the entire session – you just never know what you’re going to get. So, from a theoretical perspective, it’s never too late to schedule a professional photography session for older infants and young toddlers. Realistically, though, every stage of a baby’s life brings different considerations into the mix. Worth Noting: In order to make this ideal window, you’ll definitely want to book your session long before your baby is born. This is the only way to rest assured a slot in your choice photographer’s calendar. What to expect: Before the two-month marker, newborns are more flexible, tend to enjoy tighter swaddling (which is used for many of the idyllic poses), have more predictable sleeping schedules (i.e., most of the time between eating and pooping – outside of when you want to sleep…), etc. Newborns between weeks 1 and 2 are still in a womb-like state, and this makes it easy to replicate in those favorite, closely bundled poses. Another bonus – newborns are less apt to have baby acne, which tends to arrive after the 3-week mark. So, if you’re ultimate goal is to capture the itsy-bitsy, soft-skinned and ultra-snuggly newborn, you’re best off scheduling a photography session before week two. Preemies are born small and may not be able to leave the hospital until further along in their development. Similarly, most twins and multiples are born earlier and are tinier than their full-term, singleton counterparts. So, in either of these cases, you may have an extended window – like up to the 5 week mark – to enjoy exquisite newborn shots. Special Note: Some babies are highly-sensitive to outside stimuli (including touch, lights, sounds, excess movement or handling by people other than their mother/immediate caregivers). This makes them unable to photograph professionally before week 8. Your baby’s comfort and safety are utmost priorities during the session. If it seems as if you have an extra-sensitive one, it’s worth rescheduling for a later date when s/he is better able to process and respond to all a photo session brings to the table. What to Expect: Week 3 to Week 5 is still a really sweet timeframe – baby depending. For example, twins and preemies will still look and act like newborns during this window, but the extra weeks allow them to adjust to post-neonatal ward life. Babies who needed more time in the NICU are happier being photographed during the Week 3 to Week 5 window as well. If you and your full-term baby have a rollercoaster ride adjusting to your new lives, or your baby simply resists the originally scheduled Week 1 or Week 2 session – this is a great way to make it up. Your infant will still be flexible and easy to pose, as well as a little chubbier (love those rolls!). However, most babies are more awake at this point and may be too big for certain props or poses. Also, some of the best newborn poses require wrapping the baby – and 3- to 5-week old babies may lustily say, “No thank you,” to that! Read, 5 Ways to Prepare for Your Newborn Session, to learn more on how to create the foundation for a comfortable and stress-free experience, and have faith that we’ll create amazing images - even if they weren’t the curled-up-newborn poses you originally envisioned. Worth Noting: It’s best to shed any expectations of what the poses will look like between Weeks 6 and 8, because there’s no way to know what your lively infant will approve of – or not! What to Expect: In all honesty, this isn’t the ideal window – especially if you really wanted that newborn look. Unless you have a remarkably compliant and mellow infant, your wide-awake and increasingly active two-month old will need a more customized approach. By this window, s/he won’t fit into the large majority of the newborn outfits we have, nor will s/he safely and comfortably sit/lay/rest on our props. So we’ll focus more on that vibrant eye contact and the myriad of sweet (and comical) facial expressions. What to expect: You can expect most newborn photographers to say, “hold out a little longer and we’ll see you in Month 4 to Month 6. The reason being that your baby is too big and awake for the newborn look, but still doesn’t hold his/her head nor sits by his/herself. This complicates things a little for us photographers, that’s why we suggest waiting to book a professional session for a little later. You’ll capture plenty of memorable photos on your own during this time, and I recommend printing and displaying them with pride. Worth Noting: If it turns out your baby is not the best candidate for a newborn session, or you blew past the 8-week window, we typically recommend rescheduling around Month 4 to 6. 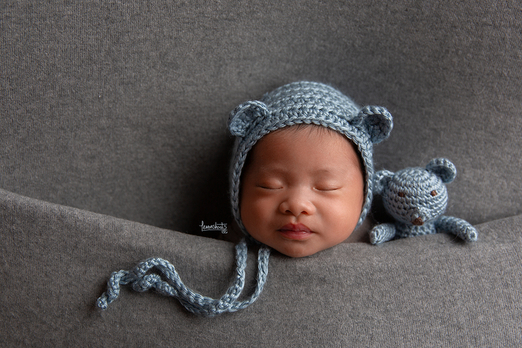 Contact a newborn photographer to discuss the possibilities. What to Expect: Your 3-month or 6-month old baby seems gargantuan when compared to his/her newborn self. At the same time, s/he is remarkably tiny compared to when s/he’ll start kindergarten – or as a college graduate. When you view babyhood through the lifelong viewfinder, pictures of older babies are still exceptional because they highlight a fleeting phase in your child’s life. Between Months 4 and 6, we’ll be able to capture some of those exciting milestones – big gummy (or single/double-toothed) smiles, sitting up, getting up on all fours, making more intentional and engaging facial expressions, and so on. Perhaps your little one will have chosen a favorite lovey or stuffy at this point, which is worth capturing before it’s worse-for-wear. Or, maybe long-distance grandparents or other special family members are finally able to visit. Each of these milestones deserves to be celebrated – and what better way to permanently commemorate them than with priceless photography and canvas-worthy imagery? As parents who have newborn photos know, professional images almost always look better than the DIY photo shoots you try to create at home. So, even clients who have professional newborn photos done often schedule an additional session around this time to mark another important window in Baby Time. Worried you missed the newborn photo moment? Don’t be! Contact me here at Lemonshoots and we’ll discuss the possibilities. (510) 747-9019.